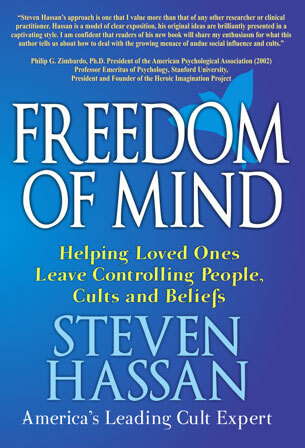 Steven Hassan’s latest book, Freedom of Mind: Helping Loved Ones Leave Controlling People, Cults, and Beliefs, just released in summer, 2012, is the latest in what can be seen as a trilogy of sorts, starting with Combatting Mind Control in 1988 and then Releasing the Bonds in 2000. A large portion of the material in his latest book is a verbatim repetition of material from Releasing the Bonds. In his most recent book, Hassan reports that his sister was the impetus to changing his “approach” in interaction away from interventions, an activity that Hassan has been involved in for over 30 years. In the preface to this book, Hassan repeats the story of his introduction to and his exit from the Unification Church (Moonies) and how that exit helped him find his life work of education and liberation from “mind control cults”. However, it is notable that in this third book, Hassan has greatly expanded his target audience due to what he says is cult activity “increasing exponentially,” and the “rise of the Internet”. Since Hassan maintains a substantial Internet presence through his Web site, www.freedomofmind.com, it could be argued that he has increased public sensitivity to cults, thereby magnifying the importance of his solutions, as well as providing a forum where he can extensively promote his own theories and agenda. “Cults are on the rise” seems to be the theme of this latest book. But there is no proof of this claim. Hassan offers no scientific study or survey with statistics to prove his theory. It may be that “cults are on a downward turn,” or perhaps “cults have stayed the same”. These possibilities may not help in the marketing and sale of books, but they are two equal possibilities. Of course none of these statements regarding the growth or decline of cults is based upon scientific evidence. Hassan’s theories are not genuinely informative in any factual sense. It seems to me that Hassan’s purpose at conflating cult numbers is to frighten people and provide him with a marketing tool to sell books, rather than genuinely seeing so many groups and/or relationships as somehow being “cult-like”. He certainly hasn’t proven otherwise in this book. It’s interesting to note that Mr. Hassan has written the preface to his new book. In the preface he offers the usual anecdotes and testimonies to his success. Hassan defines both the problem and the cure as “cult like traits seen at every level of society.” Postulating his theory about an overwhelming societal problem, Mr. Hassan then offers his own unique solution. It is important to note that within his third book Hassan has added new ingredients to his definition of a cult. He claims in the first chapter that a cult uses (1) authoritarian leadership, (2) deception, and (3) destructive mind control. The title of his new book now mentions “beliefs,” but this is not in his definition. It is troubling that a book supposedly written to educate the public about cults would even enter into the area of “beliefs,” when almost all cult educators and experts don’t focus on beliefs, but rather on harmful practices. In fact, it is a myth that cults are solely defined by beliefs. After all, the First amendment or Establishment Clause of the US Constitution guarantees the freedom of religion, which includes the right to believe whatever you wish. Hassan persists in using the term “destructive mind control,” which is not a term used in any legal setting and that has no real meaning. Mind control seems quite ominous and rather sensational, but this term does nothing to further the discussion about the dynamics of cults and how they operate. The research done in this area does not mention the term “mind control,” but uses terms such as “undue influence”, which express a more precise and exact meaning. 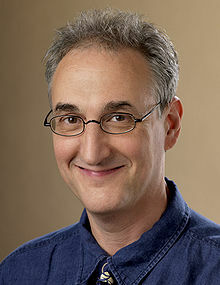 Steve Hassan’s Twitter handle also can be seen as an interesting example of his problem with defining terms and labels. His Twitter handle is “cult expert”. Being qualified and accepted in a court of law as an expert is typically meaningful proof of expertise. But Mr. Hassan has never provided expert testimony in a court of law. What authority then, outside of Hassan himself, has officially recognized him as an expert concerning cults? For that matter has an authority officially recognized Hassan as an expert in anything? Steve Hassan’s latest book, just like the one before it, is self-published. If Mr. Hassan were in fact “the #1 exit counselor,” surely he could find a publisher. Having a publisher would bring in the much needed contribution of objective professional editing, and perhaps a peer review process, which might have made this a better and more credible book. Starting with page 6, Hassan describes what he calls “common cult scenarios”. These accounts may be the factual descriptions of actual cases or composites, but they read like the most sensational scenarios. Hassan repeatedly places himself at the center of these brief case examples. He is the hero. He never fails to come up with just the right thing to say to successfully get through to a cult member. Once again this fits a familiar pattern. Just like Hassan’s statement about the rise of cults, these scenarios appear self-serving and seem designed to elevate Mr. Hassan to a pedestal. Apparently, he is the one that can snap people out of a cult with just one or two artful remarks. He thus sets himself up as the ultimate authority on what to say and when to say it. There is no mention of similarly artful things, which family members can say, even though the supposed purpose of this book is “helping loved ones” out of cults. The definition of cult put forth by Mr. Hassan could be applied to many groups. He offers insufficient distinctions between what he considers a cult and what might be considered an ordinary group. The message in this book seems to be that Steve Hassan has somehow become the final arbiter who will define such things for everyone. In Chapter 2, Hassan introduces Lifton’s eight criteria or psychological themes for thought reform, another term used to define “mind control,” even though Lifton never used the words mind control in his work. Hassan also introduces Singer’s 6 criteria and brings in the social psychology construct of cognitive dissonance. Even though Hassan names the origins of these ideas, nowhere in the body of his book within any chapter does he include properly cited references. In fact, the reader is told near the end of the book that a bibliography is not available, but rather can be found at Hassan’s Web site. This is certainly not in keeping with any protocol of academic writing and seems like a device to minimize as much as possible the owners of the ideas that Hassan claims as his. Not including such text references when you have depended upon the ideas of others might be considered something akin to plagiarism. This penchant that Steve Hassan has for borrowing upon the ideas of others without specifically cited attribution should be glaringly apparent to anyone familiar with Neuro-linguistic Programming (NLP). According to Mr. Hassan’s first book Combatting Cult Mind Control; he has studied NLP extensively with its founders. He has also described how NLP and the writings of its predecessors influenced the development of his own cult intervention model. In Hassan’s latest book (p. 208-214) he discusses concepts and techniques that come from NLP such as Visual Kinesthetic Dissociation and the idea of representational systems. But he fails to cite their source. Hassan makes no mention of NLP whatsoever, nevertheless borrowing from it quite heavily. This is especially troubling, given that NLP remains highly controversial amongst people that study cults, particularly because it can be seen as a manipulative technique of persuasion. NLP also poses an ethical dilemma when used within the context of cult intervention work. The integrity of an intervention and for that matter the interventionist is compromised by the use of such deliberately deceptive techniques and manipulation. On page 23, Hassan introduces what he describes as the powerful BITE (Behavior, Information, Thought and Emotional control) model, something that he seems to see as a superior definition of the manipulation involved within cults. Much of the BITE model is borrowed material from a 30 year long tradition of social psychological research. In reading the elements of the BITE model within Hassan’s current book, that model has now been greatly expanded from his previous two books. The BITE model he now proposes is so broad that it could be applied a very wide array of groups. What is troubling is that Hassan has not provided any guidelines to separate out the groups, which might warrant the cult label and those that do not. The BITE model, as now applied by Hassan, has become a kind of philosophic construct not grounded in facts, but rather theories, many of them borrowed from others. This composite philosophical approach as now devised by Mr. Hassan might be called “Hassanology”. In the world of cults Hassanology essentially depicts Steve Hassan as the ultimate savior. He is a hammer, and there is an ever expanding list of groups to be seen as nails. As they say, “When you are a hammer everything looks like a nail”. Of course this might once again simply reflect a convenient marketing strategy. Hassan, repeating themes from his previous two books, introduces on page 52, this idea of dual identities, i.e. a pre-cult identity and a cult identity. There is no evidence of a cult identity v. a pre-cult identity. It is not even established that human behavior works in this way. These are not constructs that are generally accepted in psychology or professional counseling. These claims exist entirely within the confines “Hassanology”. Again, the tone of Mr. Hassan’s book is that these beliefs are true, rather than just one person’s untested ideas. Another troubling claim is that Hassan believes that all cult members suffer from phobias (p.56). Again, Hassan presents his idea as an absolute truth, ignoring the fact that there is no scientific theory and/or scientific evidence to back it up. Hassan seems to think that his ideas on phobias mesh with his claim that all cults practice hypnosis. He doesn’t acknowledge any exceptions. According to Mr. Hassan all cults do these things. It is true that many cults teach members that leaving the group is wrong or bad, but where are the scientific studies that conclusively demonstrate that this practice constitutes phobia indoctrination? In Chapter 3, Hassan re-introduces his intervention model, the Strategic interaction Approach (SIA). He states that this model will “promote change and encourage growth in the family as well as in the cult member” (p. 36). Mr. Hassan promotes this model as the preferred alternative to “old style” deprogramming and/or “exit counseling”. However, what Hassan does not discuss here or for that matter in his two preceding books, is that his approach includes elements of counseling. And there is nothing specifically mentioned about the cult member being counseled explicitly understanding that they are participating in counseling, i.e. informed consent. In fact, it appears that Hassan does not see the need to offer his SIA counseling as a matter of choice, but instead uses the family dynamic as tool to keep the cult member talking and then to spring his counseling upon them without informed consent. All professional counseling requires such an understanding and explicit consent before it begins. Counseling, by its very nature, is persuasive and constitutes an unequal power dynamic. A licensed professional counselor that does not know this can do harm to people. People must agree and be amenable to receiving counseling, regardless of what the setting or stated goal may be. The ends do not justify the means. This principle is often cited concerning the questionable behavior of cults, and should apply to those attempting to help cult members as well. It is important at this juncture to point out that there is really nothing new or unique about the SIA approach. It merely represents a reworking of family systems theory, with no credit given by Hassan to its pioneers, such as expert family systems practitioners Virginia Satir or the Milan Family System theorists. SIA relies heavily on the body of theory and practice within family systems. Hassan’s remarks about the superiority of the SIA over exit counseling within his books is a thinly disguised attempt to say his method is fundamentally more effective, and therefore has better results. However, nowhere does Hassan provide a base rate and/or any type or accepted statistical method defining his results or what constitutes a successful SIA type of family work with a cult member. Yes, Hassan provides anecdotal evidence selectively through testimonials, but there is no way to check if these are legitimate or edited for content. These testimonials are always glowing and positive, which is one of the major drawbacks to using testimonials; it’s deceiving and engenders the idea that your work with cult members is superior, always successful, and has better outcomes than any other approach. This is why professional organizations such as the APA (American Psychological Association) have discouraged reliance upon testimonials. In contrast, one of the defining characteristics of pseudoscience is an over reliance on such anecdotal evidence, rather than scientific study. Is the SIA approach the best approach? What happens when a cult member does not have a family suitable for the SIA approach? Is that situation ignored? The SIA approach, as advertised, has the family doing the bulk of the work and seems to include both deception and emotional blackmail to make it work. Current cult members are never told they are facing an intervention. They are not told they will be subjected to counseling. And they are in a situation where family members confront them with family issues and disappointments, often in a very emotional way, which may be used to persuade the cult member to leave the group. In Chapter 13, the last chapter in the book, Hassan conjures up possible solutions to the “cult problem”. First, he suggests more involvement by the legal system. Apparently he doesn’t realize that the legal system is already actively involved in sorting through cult issues. Perhaps Mr. Hassan’s ignorance of this fact is because he has never testified in any legal proceeding. Second, Hassan calls for action by mental health professionals to join the “cause,” and that they should be trained in his SIA approach. However, such training would be of questionable value and essentially redundant, since SIA is merely family systems, which is quite familiar to mental health professionals. In what appears to be a contradiction, he also states that people can use his book to develop their own approach, working with their family members themselves. Why then the need to gather a group of mental health professionals under Mr. Hassan’s guidance if families can do this independently? He seems to cotradict himself. In my opinion proper distinctions are not sufficiently made regarding what are actually Hassan’s purported ideas and the ideas he has copied from others, which have not been given proper attribution. And providing a general bibliography on a Web site simply does not meet either the academic criteria or ethical responsibility regarding meaningful attribution. Although Hassan is obviously not bound by such academic codes of honor, borrowing the ideas of others without citing them has frequently resulted in the expulsion of students from graduate school programs. No reputable academic journal would accept or countenance such omissions. Has Hassan fallen into an academic trap? Does he believe that what he learned from others years ago has somehow now been transformed into his own ideas? Is he somehow convinced that he now owns those ideas? The citation of sources is always an academic requirement and should be an author’s ethical responsibility, regardless of how long ago someone might have been introduced to the material. Mr. Hassan’s latest book gives the impression that he sees his methodology as the only way, but there is a woeful lack of objective evidence to prove his theories. It’s curious that Hassan includes pages on how to battle his critics. Isn’t it possible that other ideas might be valid? At the very least, extraordinary claims should require extraordinary evidence. Or has Hassanology become an “absolute science”? It is interesting to note that on page 25 under the condition “thought control,” is listed the “[r]ejection of rational analysis, critical thinking and constructive criticism”. This is an excellent point and one that should be followed by every cult critic, cult interventionist, professional counselor, or expert. This would include accepting criticism without becoming defensive and the ability to see and correct problems. Debate should be based upon rational analysis. A person working in the cult recovery or education field should endeavor to emulate these characteristics. It is incumbent upon him or her to model this behavior, as it is the rejection of such values that quite often forms the basis for criticizing the leaders and dynamics of cults. Cathleen A. Mann has a doctorate in psychology and has been a licensed counselor in the state of Colorado since 1994. Dr. Mann has done research regarding cult formation and the recruiting and retention practices of high demand groups. She has been court qualified as an expert in 12 states. Update: This review was quoted by a purported “cult” in an online video produced to examine and/or criticize Steven Hassan. Subsequently Hassan’s supporters contacted the author of the review and CultNews suggesting and/or requesting that this article be deleted. Read more about this in the following CultNews report. The Ross Institute does not recommend Steve Hassan see this disclaimer. Steve also unethically and hypocritically misuses his inside knowledge of cult leader methodology to promote his personal political agenda using the “undue influence” carefully created with deception by omission. He makes endless emotionally charged attacks designed to instill fear and hatred against one candidate over the other by fluently using the I and E in the BITE model. One only has to follow his unending river of caustic one-sided political rants on Facebook for a short time to see first-hand how lopsided and emotionally manipulative his cult leader like inflammatory political arguments are. When asked to use his alleged therapeutic skills to psychoanalyze the dangers of the other candidate whom he blindly supports and shamelessly promotes he refused. To have an ounce of professional credibility a person must endeavor to promote an honest and scientific argument at all times and hold themselves to the same standards of professional conduct that they demand of others. I’m very disappointed that more people are not calling him on his lack of integrity as he promotes a very self-serving and profitable personal agenda.